The beautiful days are there and, with them, a few guests invariably present every year: ticks and fleas! The mild temperatures are indeed conducive to the multiplication of these parasites. Fleas and ticks are hematophagous parasites, that is, they feed on the blood of their host. 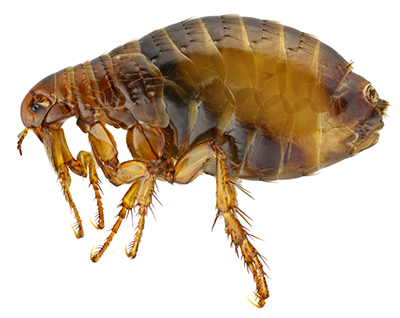 The fleas are flat, brown in color and measure a few millimeters in length. Only adult fleas contaminate pets. The flea stings its host to ingest its blood and then 24 to 48 hours later, lays eggs that will be scattered throughout the environment of the animal. The other stages of development of the chip therefore occur in the environment. Eggs, larvae and nymphs like a lot in our warm and cozy homes. It is for this reason that fleas can contaminate dogs and cats all year long! Depending on their stage of development and the amount of blood they have ingested, ticks range from a few millimeters (tick on an empty stomach) to more than 1 centimeter (when they are full of blood). Adult ticks, but also larvae and nymphs, are hematophagous. They perform their blood meal on small mammals for the earliest stages then on larger mammals (including dogs, cats, cows, deer … and even humans). The risk of infestation is much greater in certain environments than ticks are particularly fond of, such as woodlands, fields and tall grass. How to see and recognize these parasites? To get to see fleas on a pet, you have to look on the skin, at the base of the hair, and even rather look back on the hair. The areas where we can see them preferentially are the back, the rump and the base of the tail. You can also inspect the head and belly: it can happen that they are seen running in these areas less rich in hair when the infestation is important. If you can spot them, you will see a small insect moving very quickly over the skin. No need to hope to catch or crush fleas, it's usually impossible with your fingers. They are, indeed, extremely fast and have a carapace that protects them very effectively: To have more chances to observe fleas, you can spend a very fine comb on the back of your animal. You pass the comb and you drop what you harvest on a white sheet or a compress. Unlike fleas, ticks do not move on the animal. You can find ticks by carefully inspecting your pet: It is, indeed, sometimes possible to feel them by stroking or, depending on their size, to see them directly. On observation, they can be confused with a wart or a cyst, especially as some ticks are pink. But looking carefully at the base of the hairs, one can see the head attached to the skin and small paws on the sides. Above all, do not try to remove a tick by pulling on it or with tweezers after having covered it with ether: a part of the head would remain, indeed, under the skin and could provoke an inflammatory reaction (on the other hand in order to combat an idea that is still widespread, a tick does not "repel"!). For easy and complete tick removal, there are some very effective tick hooks that can be purchased from your veterinarian. Do not hesitate to ask him for advice. Because of their speed and small size, it is often extremely difficult to see fleas directly on their animals. You will understand: not seeing a flea does not mean that your pet does not have one! It will, however, often be much easier to observe traces of their presence: their droppings. Flea droppings are small blackish dandruff at the base of the hair. They are observable by spreading the hair in various places and more particularly in the areas mentioned above (rump, base of the tail …). They can be harvested by combing on the back of the animal or by applying a wet compress to areas where they have been spotted. To be sure that it is indeed flea droppings, deposit these films on a white handkerchief or a compress and wet slightly with water. By dispersing, these droppings will leave a reddish trace, sign that it is well digested blood. The presence of fleas should also be suspected when your pet is itchy. It is common for an animal infested with fleas to scratch, although this is not systematic. In an animal allergic to flea bites, dermatological lesions very important may appear: redness, crusts, depilations, even if fleas are not present in large quantities on the animal. This is called DAPP or DHPP: Flea Allergy Dermatitis or Flea Bite Hypersensitivity Dermatitis. Itching in homeowners can also be a sign of the presence of this parasite in the home: after multiplying in the environment (parquet, carpet, carpet, etc. ), fleas can sometimes bite humans, causing the appearance of pimples and itches very unpleasant. Ticks, meanwhile, leave very little clue after their passage, except for a possible small redness, or even a small blister, which remains difficult to detect. your pet may have been parasitized by ticks without you noticing. Why avoid at all costs the presence of these parasites on your animal? In addition to the itch and allergy risks described above, which are already an excellent reason to protect your pet, flea and tick contamination can also promote the transmission of pests and diseases. Fleas can in particular transmit worms, in particular a tapeworm (Dipylidium), of which they are often carriers. In cats, fleas can also transmit a disease called feline mycoplasmosis (feline hemobartonellosis), responsible for the destruction of red blood cells. Although infrequent, this disease can be very serious for affected animals. In the same way, ticks can transmit many diseases in the dog, such as piroplamosis, Lyme disease (canine borreliosis) but also ehrlichiosis or anaplasmosis. These diseases are becoming more prevalent and it is important to know them. Thus, if your dog has symptoms such as fever, depression, pale mucous membranes, bleeding, abnormal staining of the urine or joint pain, contact your veterinarian without delay, even if you have not seen ticks on your dog because these pathologies can be very serious and must be taken care of as soon as possible! It is not because you do not see a flea or tick on your animal that it does not have one! To be sure to avoid their presence, only one way: prevention. Very effective antiparasitic treatments exist in various forms to prevent your dog or cat from being contaminated: spot-on pipettes, sprays, necklaces or even tablets. Ask your veterinarian for advice, he can recommend the best treatment for your pet and his lifestyle.